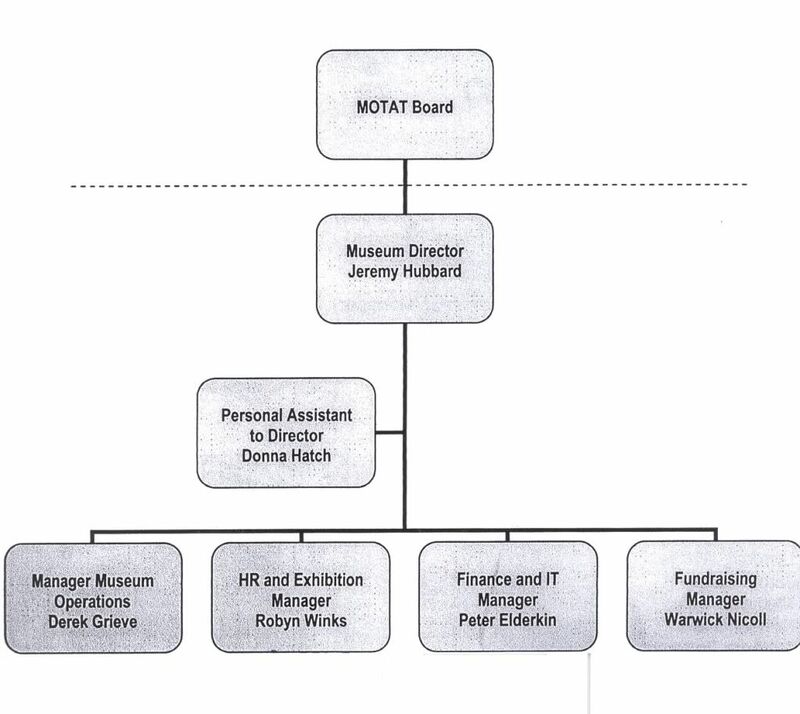 Someone asked recently, who runs MOTAT so here's the organisation chart. Under the MOTAT Act the board comprises appointees from the contributing city/regional councils plus members from the MOTAT Society. Under Derek Grieves in operations are Sandra Engl (Conservator) and her team plus the various collections managers (Aviation, Road Transport, Rail etc) The volunteers are organised by each collection manager. Hope this helps explain the system. Did the Board get a lot smaller when the six councils merged into one? Motat has two aviation events this month. Currently running is the photographic exhibition 100 Years of Kiwi Flying, weekdays 10 to 2.30. It details the Walsh bothers days. On March 19 and 20 10 til 4 is their military weekend including helicopter rides along with tanks and half tracks. Should be a fume filled weekend. (I expect to be there 10-2 Sunday, including taking my gf's wide-angle lense into the hangars), and that Motat airfield will be closed from Monday until September. 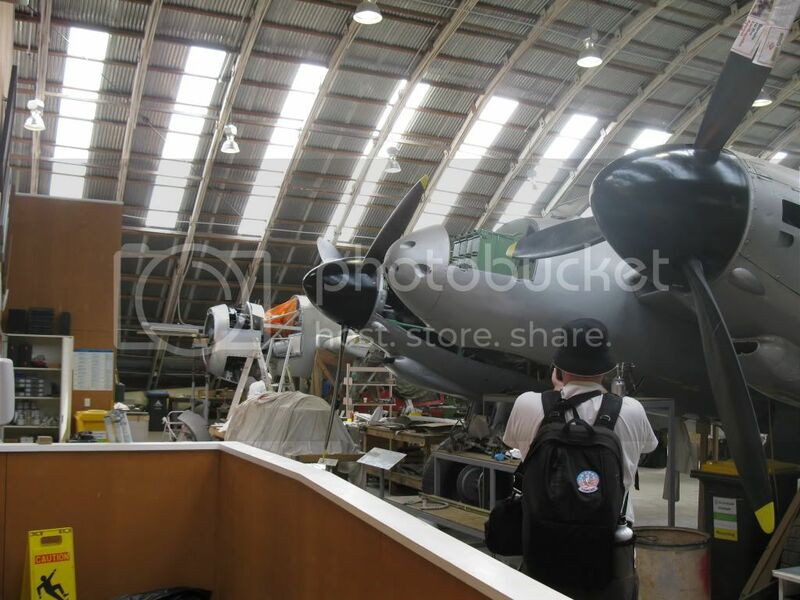 MOTAT’s Meola Road Site is currently undergoing a facelift as we prepare for the opening of our new Aviation Display Hall in September 2011. The site will be closed to visitors temporarily from 22 March 2011 as we prepare for this exciting new addition. Looking forward to seeing the new exhibition space! I too will be there around 10am for a couple of hours so if anyone else from the forum is going to be there perhaps we could meet. I thought it was only going to be closed for 6 weeks and not 6 months. Any ideas on how we can get update photos in that period. Has the date been set for its reopening in Sept as my wife and I are going to be in Seattle for a couple of weeks. I, of course, will be doing Boeing, Museum of flight and anything else aviation. Hopefully the Evergreen museum, home of the Spruce Goose. Hope you enjoy the day. I may catch up with you. The newly poured floor takes two weeks to set properly and at our briefing last week the September Rugby Cup is the key target date for reopening. In the meantime the rear wall of the old hangar will be removed and the two buildings joined. The exhibits are being pushed forward to allow workspace. Aviation hopes to have the Sunderland and Solent prettied up and indoors by them Others like the DC3 will be cleaned and postioned . Repairs will be done later. of the big aircraft into tight spaces can be done. The Hastings U/C retraction system will be up and running and the Harvard is ready for roof hanging. There are a few of us there on the weekly roster and will post pictures of the happenings. Dave , as far as I know , the board remains the same and guess will do so until the next AGM. How about at the aviation workshop after the Pacific battle (which starts at 11.30). I'll have a Wanaka floppy hat on, and be carrying two cameras. Cool. In keeping with my Login I will have my corsair cap on courtesy of the Air force museum. Corsairman, I have been to Seatle a lot in the last 2 years. When you are at Everett (Boeing factory) there is also the Flying Heritage Collection (owned by Microsofts Paul Allen) which own the Alpine Fighter Collections Spitfire V, Oscar, 109E and I16. Also have newly flyable Fw190, long nose FW190 and flyable mig 29! There is also the Boeing Museum of Flights restoration hangar.....You can look inside the Comet 4. Also have F8, 727 and quite a few other jets. The reproduction ME262's are made somewhere on the field and last year another collection was open up for display which have a B25, P51C. Great. Thanks for the info. My sister in law lives there and just this past week she has been looking things out for me so together with your info I should hace all basis covered. The only thing still outstanding is how to get down to the Evergreen museum as I beleive it is about 2-300 mile south. There is another museum of interest, Tillamook air museum. A very nice collection of aircraft in a mammoth woodern building, an old blimp hangar. Corsair, I have a good friend in Seattle ex F-100C and F-104C jockey whose flying career was cut short because of a systems failure on take off in an F-104. He is very much into aviation history and modelling and knows all the places. I'm sure he wouldn't mind answering any query you have on where things are. If you are interested PM me for his address. Good day out today. The WW2 and Vietnam battles were good. MOTAT is supporting re-enactment groups that 'fill the gap' in terms of theatres covered, so we had Afrika Korps and Japanese camps. Met up with cosairarm, and he wrangled us into the restoration hangar. By the way, I love my girlfriend, and her 10-24mm lens! Now Errol I told you your pictures would be better than mine and I was right but I couldn't help but load this one of you, your girlfriend and the Mossie ;D It was good to meet you and I'm glad we were able to go through the hangar. I must admit it was good to see the progress being made with the engine on the Avenger, the spinners on the Mossie, the Harvard appears finished as it was all covered up ready for the move. The Hastings undercarriage in the frames and the hive of activity on the Sunderland in repairing the keel after it was damage when it was blown off the dolly. Also thank you to the members who have given me some tips re My Seattle trip and KB I will PM you once I have worked out how to do it. Great photos chaps. The Hudson looks shiny, is that wet paint or ultra gloss paint? The Harvard and the Hastings undercarriage are both going to be interesting displays as they've both been rigged up to move - the museum goer will be able to retract the Hastings undercarriage, and the Harvard has all its hydraluics working I believe and has a special electronic box inside to control movement of things like flaps, ailerons, rudder, etc. Cool to see such innovative things happening. The spinners really look great on the Mosquito. 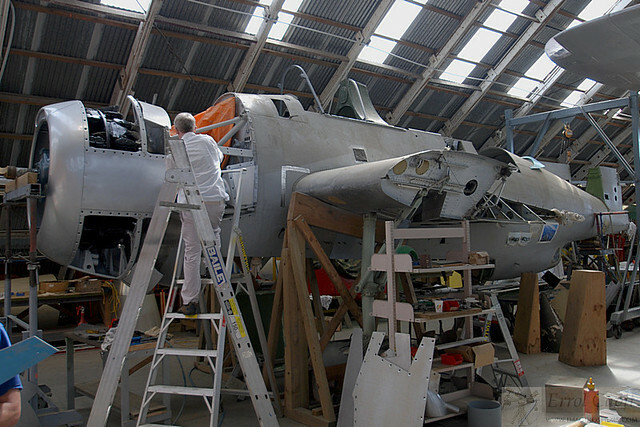 I guess the Avenger will be in the restoration hangar a long time after the rest of the new hangar opens. It is apparently to be painted in Fleet Air Arm colours and placed in the Fleet Air Arm of New Zealand section, which will surely meen a bit of a shuffle to get it into that end eventually. I think the shiny is the final finish. However they got the brown and green the wrong way around and are in the process of re-doing (if I understood a comment correctly). There are chalk lines and helpful words like 'GREEN' and 'BROWN' marked. Note the shiny green (in contrast to the green on the fuselage) on the nacelle below. Is the under-wing roundel correct, or only part-done? I didn't think the Hudsons wore A or B schemes! I'd say the roundel is finished, as they wouldn't have had white bars with the Green/Brown scheme. From what I can work out this aircraft is representing itself in late 1942 to early 1943 when flying with No. 2 (GR) Squadron at Nelson. The fuselage roundel is correct for that period. The wing roundels on the Hudsons of No. 3 (GR) Squadron which were at Santo and Guadalcanal were adapted in november 1942 from memory so I beleive this operational roundel would also be correct for that era for a Hudson in the pcific, however I'm not certain if those at home were changed to the blue-white-blue that early on. I had some correspondence with Norm at MOTAT on the colours and basicly no-one in the team had any real idea of what the colours should be to make it accurate, so I sent him some photos I had and he had also been in touch with the Air Force Musuem, so these roundels may be based on their advice. They are at least trying to get it right. I think maybe they should leave it out in the weather for six months to dull that shine down though!! Oops, did I say that?